Contest: win two tickets to the 2018 Breeders' Cup. 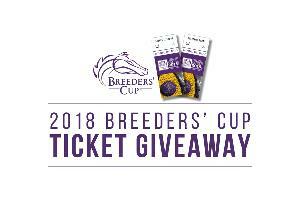 win two tickets to the 2018 Breeders' Cup. Prize: Prize is two (2) tickets to the 2018 Breeders' Cup on November 3, 2018. Statistics: This contest was opened by 39 and entered by 0 ContestChest.com members. 0% of those who opened the contest, entered it.